500 words from is an occasional series in which novelists talk about their newly-published novels. Fiona Mitchell is British writer and journalist who spent three years in Singapore before returning to the UK. The Maid's Room is her first novel. It explores the lives of female migrant domestic workers in Singapore, and of the luckier expat women who employ them. I'd been a journalist for 13 years before a dream that I'd buried reared up all over again: I wanted to write a novel. I'd tried several times before, but always abandoned the book after the first chapter. This time was different - I started the book in December 2010 and kept going until the very end. What kick-started me was this: I moved away from my home in London to live in Singapore for almost three years. Everything I saw there seemed sharper, the colours, the sounds, the smells, the way people acted. I felt more awake somehow. I'd been wallowing for too long in my inability to have a second baby. And in Singapore, I was struck by the sight of women whose pain was much more acute than mine. It was pouring with rain one day, the water rivering down the street, when a flashy car drove past me. Hands peeped through the bars of a gate in front of a driveway, pulling them open, and the car turned in. Behind the gate there was a Filipina domestic helper, downcast and drenched. It was a Sunday, so why was she working? I thought. Back then, there were just over 200,000 domestic helpers working in Singapore and none of them had a legal right to a weekly day off. I began speaking to domestic helpers whenever and wherever I could. It transpired that many employers weren't interested in the uncomfortable truth about their helpers' lives - the children they hadn't seen in years for example, or the pain of their rotting teeth. Some employers locked away the women's passports, and made them sleep in windowless rooms or cupboards. At first, I thought I could write a feature about the women's lives, but the subject of modern-day servitude felt bigger than that, deeper. I decided to explore the issues in a novel instead. I hoped that might have more resonance than a newspaper article, and would get people talking about the way poverty forces millions of women across the world into poorly paid domestic work. I became obsessed by writing the book, writing late into the night and getting up super early to return to my characters - Tala, Dolly and Jules. Even when it seemed I might not be able to get the book published, I kept going, rewriting, editing, even ditching two entire books then starting from scratch. I just wasn't prepared to give up. I took a lot of inspiration from the women that I'd spoken to in Singapore - they were trying to change the lives of their families, earning money to send their younger relatives to school. Seeing that grit helped me tap into my own. I was once asked whether my book is a campaigning novel, and although it does seek to build understanding, calling it a campaigning novel makes it sound rather worthy. First and foremost, I hope I've written an entertaining book that's moving, and funny in places. It looks at how people cope when their lives swerve completely off course. The overriding theme is kindness. Just like some of the characters in the book, we all have the capacity for terrible cruelty, but if we listen, if we try to understand, we can be kind. 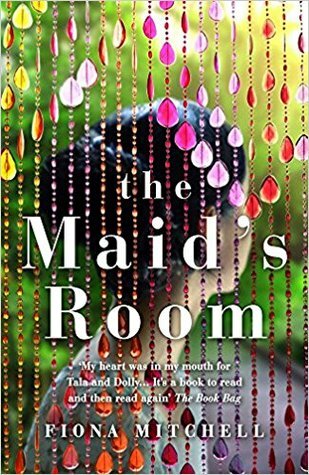 The Maid's Room is published by Hodder & Stoughton in hardback. The paperback is released on 19 April 2018. Priced in local currencies.